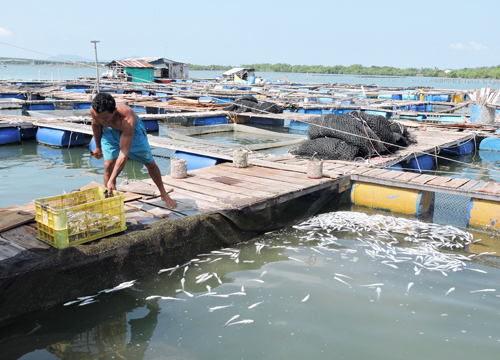 BA RIA-VUNG TAU (VNS) — The Environmental Police Department in this southern province has decided to fine eight fisheries processing plants for polluting local rivers. These plants have discharged wastewater every day into Cha Va River in Tan Thanh District's Tan Hai Commune. The wastewater pollution is one of the causes behind the mass deaths of fish in local fish breeding farms, police said. Earlier this month, farmers had carried hundreds of dead fish to the local People's Committee's chairman, who is handling the case. The farmers' losses were expected to reach VND5 billion (US$227,000), according to statistics released by the department. The local authorities are continuing to study the land and environment at processing plants and are taking wastewater samples for testing. The Department of Natural Resources and Environment has proposed the People's Committee should request these plants to temporarily halt operations until investigations are completed and a conclusion is reached. The eight plants were fined VND2 billion ($90,900).